In a perfect world every campfire would include S’mores, and every candy dish peanut butter cups. 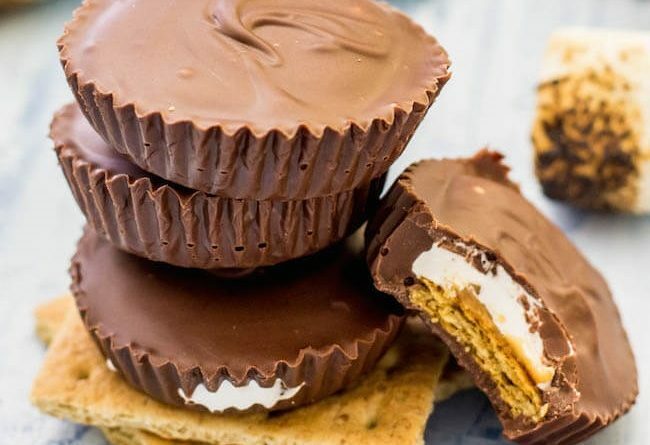 What if your cookout and your candy dish could include S’mores and peanut butter cups? we are scientists but we are pretty sure even Quantum Physics doesn’t have a calculation capable of figuring out these planetary repercussions. The idea of melding two foods to make something even more amazing is not new. Certainly in the case of peanut butter it has happened many times. PB&J anyone? The concept of marshmallow, graham crackers, chocolate, and peanut butter blended together in a portable format may just cause the end of civilization. This recipe only loosely fits our Campfire Recipe category. For one these are great for around the campfire but they aren’t technically made on the campfire. Spread each cracker piece with about 1 tsp of peanut butter — set aside.